Earlier this week, British officials refused to grant asylum to an Iranian man who had converted from from Islam to Christianity. 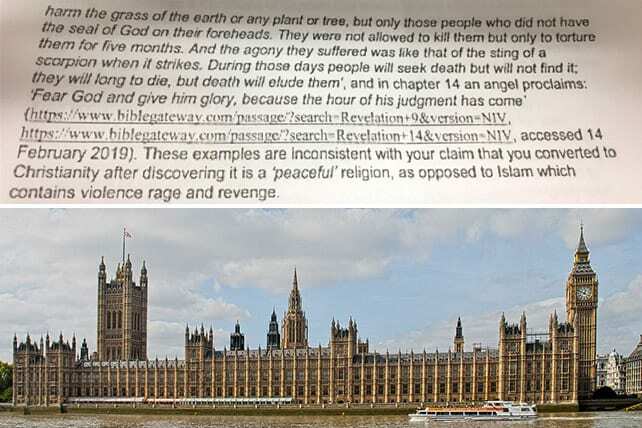 The New York Times reports that the Home Office cited verses from the books of Exodus, Leviticus, and Revelation in response to the man’s statement that he had converted to Christianity after learning it was a peaceful religion. The Iranian man filed his claim in 2016, and the government rejected it last Tuesday, according to the man’s case worker, Nathan Stevens, who posted excerpts from the Home Office’s refusal letter on Twitter.